Drama/Musical/Gainful, Japan, 1956, 116 min. Synopsis July, 1943: Japan's army is on the run. A platoon in Burma sings to keep its spirit up. Inspiration comes from their self taught lute player, Mizushima. 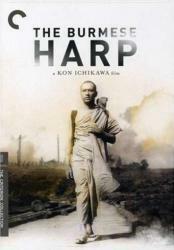 At war's end, while they await repatriation at Mudon prison camp, Mizushima is sent to convince a Japanese company dug into a mountain that it must surrender. He fails, the British attack, many die, and his companions fear he's been killed. However, he has survived and disguised himself as a Buddhist priest. En route to Mudon to join his comrades, the frequent sight of dead Japanese soldiers overwhelms him. He vows to live a life of prayer, burying bones and bodies; his friends want him to return with them to Japan.